Another day, another gold, and a world record to boot. It’s hard to come up with new things to say about this British team, they’re better than anything we’ve ever seen before. Not even Lance Armstrong in his prime was this good. 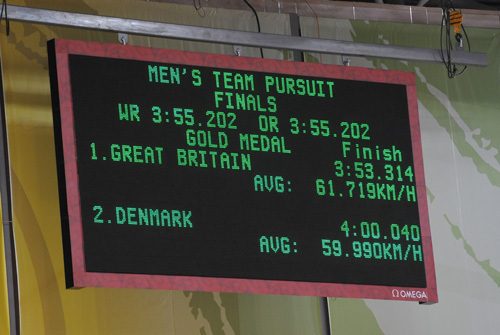 The highlight of today had to be the team pursuit world record being smashed to smithereens by the British team. They took a whopping two seconds off the record they set the night before in round one. This itself was an improvement on the record they set in Manchester at the world championships this March. The sprinters continued their seemless progression in to the semi-finals. 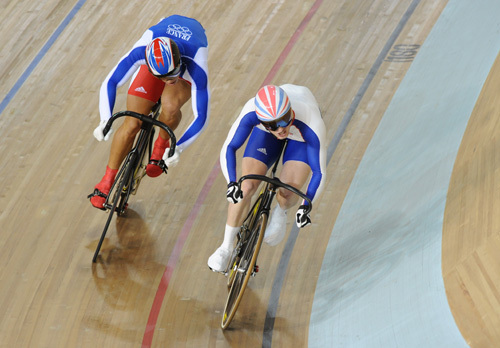 Both Chris Hoy and Jason Kenny look likely to meet in the final as no one has got close to either of them so far. In the women’s sprint competition, queen Victoria Pendleton seems to have two kilometres per hour more than anybody else. 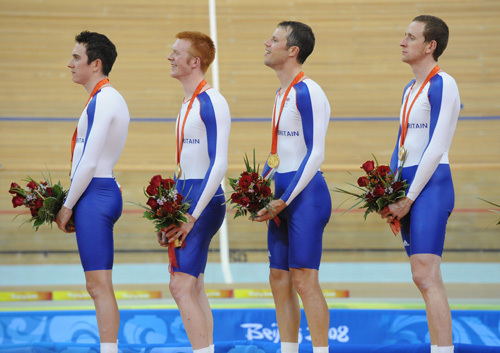 The team of sprint coaches have obviously done their job with the Brits. Once again the pictures are provided by top cycling snappers Andy Jones and Graham Watson. 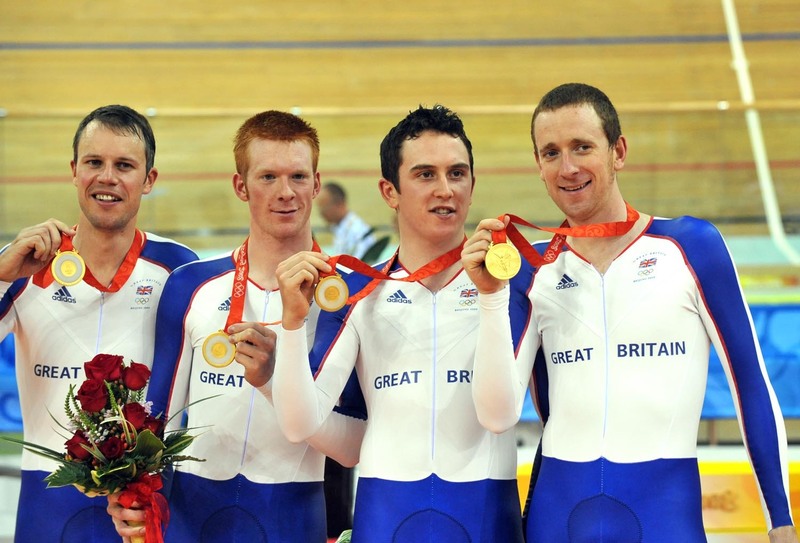 On their way to one of the standout performances of these Games, the British team pursuit quartet, lead here by Ed Clancy, race to their second world record in 24 hours. This time beating it by two seconds. 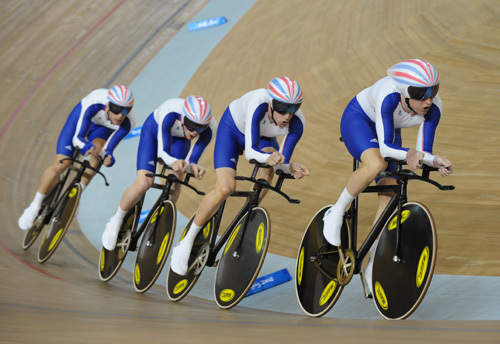 The British pursuit team fulfil their destiny and take Olympic gold, giving them a clean sweep of all Olympic and world pursuit titles. The time of 3-53.314 Should be out of the reach of every other nation for many years. 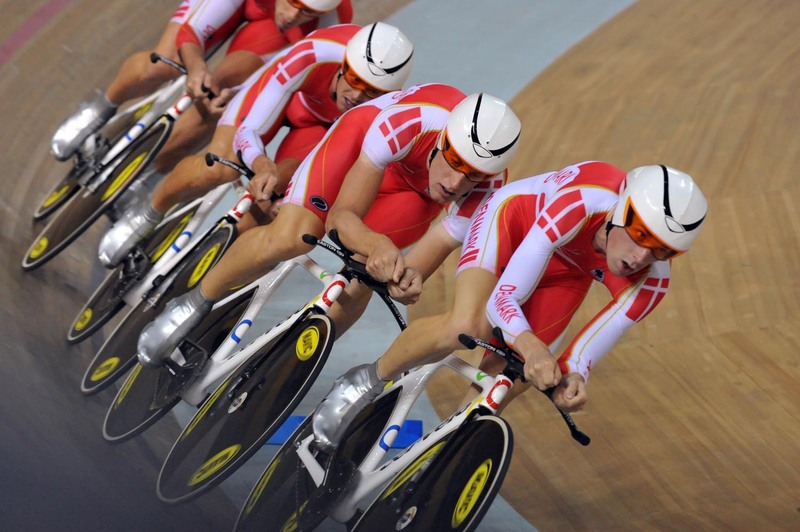 The Danish team gave the Brits the impetus they needed to break the world record after giving them a scare in the first round. Their challenge faded somewhat in the final. Victoria Pendleton cruised through her first two sprints, but looks set to meet Chinese sprinter Shuang Guo in the semis who?s looking fast and have the crowd behind her. 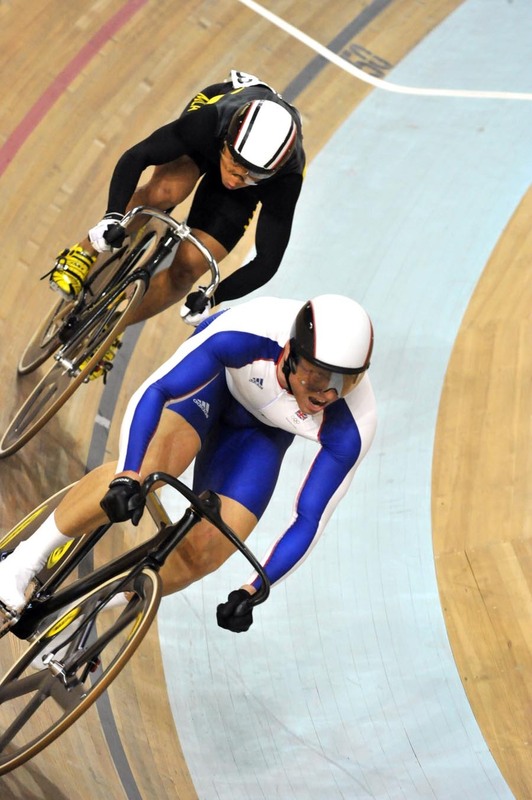 Can anyone stop Chris Hoy? Possibly not. Here he dispatches of Malaysia?s Mohd Azizulhasni Awang. The Netherlands? Marianne Vos was too quick for the rest of the field, and now adds the Olympic title to her world title won in Manchester. 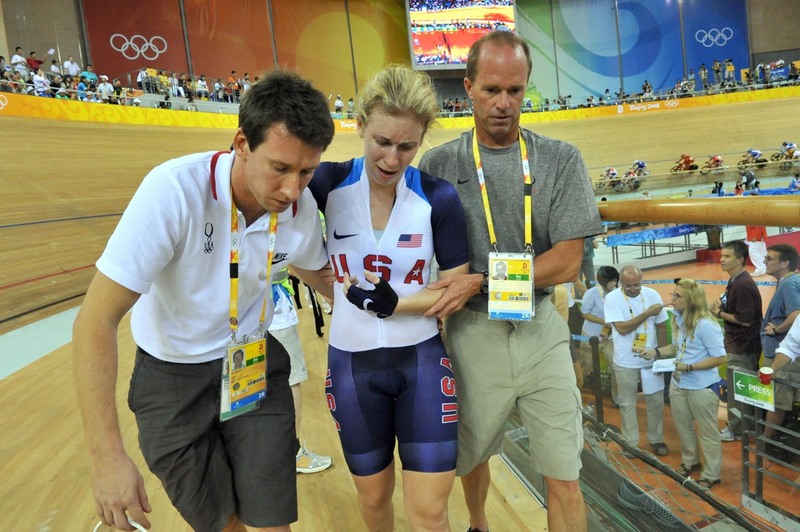 American Sarah Hammer?s disappointing Games come to an end when she crashes out of the points race. Hammer, a former pursuit world champion failed to medal in the 3k event and was then taken out of the points race. Waheey! How did that one get in there? Andy Jones gets a little distracted as he waits for the cycling to start. 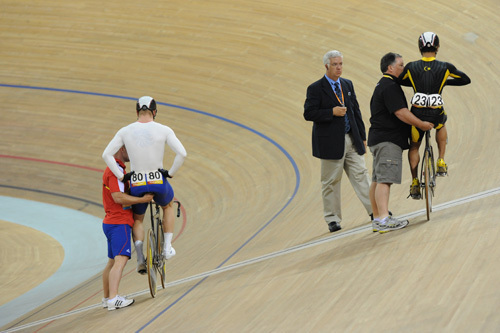 Sprint coach Jan Van Eijden holds up man mountain Chris Hoy before his sprint against Mohd Awang of Malaysia. Hoy won. Awang pulled a wheelie as he crossed the line. Smiles all round as the British pursuiters land the big one, and with a world record to boot. All together now! God save our??. , well, we were singing along. 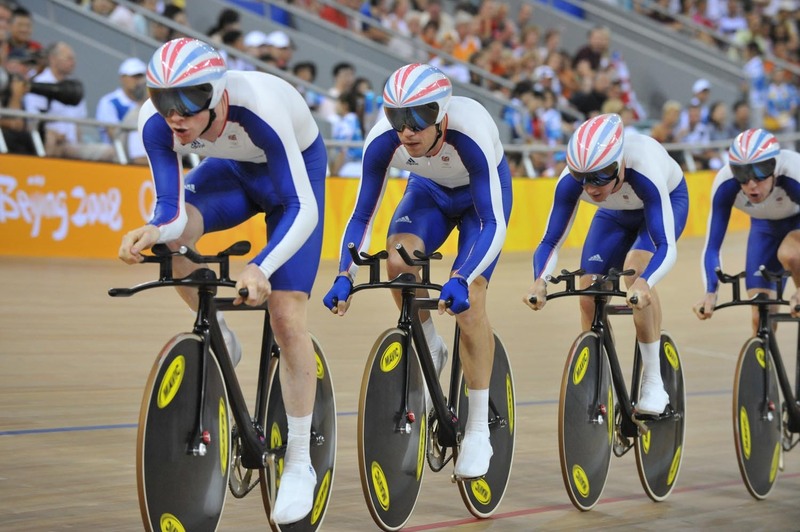 Britain?s boys in white and blue thunder along at 65kph, and making it look so simple. 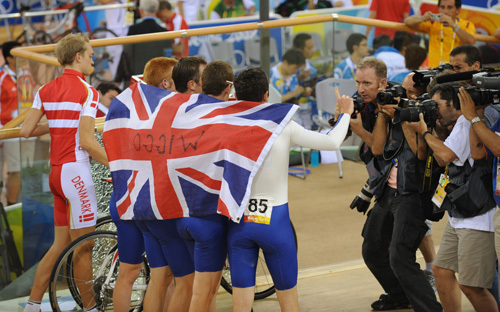 The team pursuiters grab a flag and the photographers grab a few snaps of the new Olympic champions. Rebecca Romero gets ready for the points race, her second ever. Marianne Vos bounced back from a poor showing in the women?s road race to win the points race on the track. She was the only woman to gain a lap on the rest of the field. 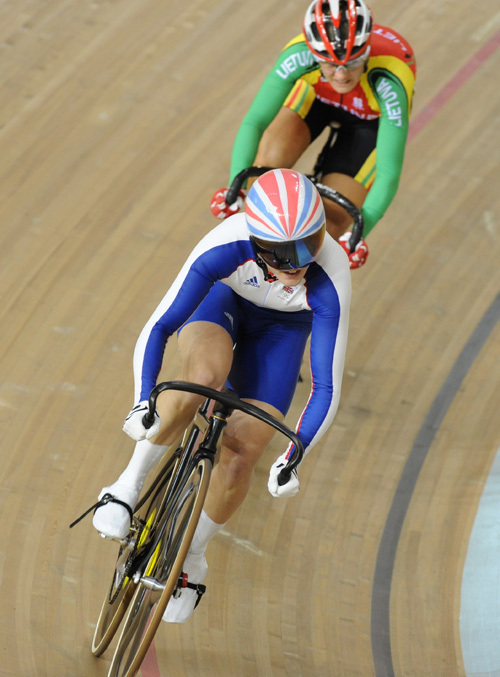 Victoria Pendleton walks all over Simona Krupeckaite of Lithuania in the sprint. Krupeckaite took silver at the worlds but knew she had no chance here, going out fast from the start and giving Pendleton a free ride to the line. The women?s points race in full flow. 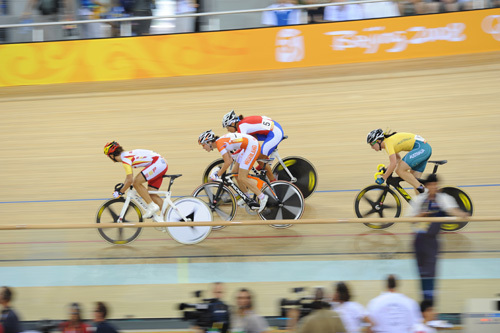 Mairianne Vos (centre in orange and white) featured heavily in the sprints and her gold saved the Dutch team?s poor showings so far. Can these legs make an Olympic champion? 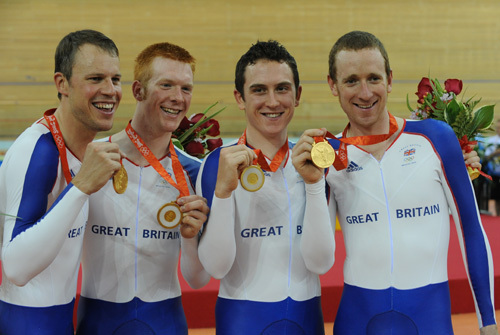 How many medals will Britain’s riders win?